This post replaces Do I have to pay for Medicaid? The MI Health Account. The comment section is still available on the original post. MEDICAID HEALTHY MICHIGAN PLAN MEMBERS WHO ENROLL IN A HEALTH PLAN WILL PAY MOST OF THEIR CO-PAYS AND CONTRIBUTIONSTHROUGH A MI HEALTH ACCOUNT. Now that you have Healthy Michigan Plan Medicaid and you have chosen your Medicaid health plan, how much will you pay and how will you pay it? There are two costs associated with Healthy Michigan Plan Medicaid; co-pays and contributions. Co-pays are small payments for services and prescriptions. Your co-pays will be calculated every 3 months based on how much you went to the doctor and what services you received. Your contribution is like a premium you would pay for health or other insurance. If you owe a contribution, it is charged every month and is based on your income. Co-pays and contributions are paid quarterly, either by writing a check and including payment coupons or by paying online through a MI Health Account. Medicaid Healthy Michigan Plan members are responsible for paying co-pays. The co-pays are small, usually $1 to $8, and you probably have not paid them when you visited the doctor. Your co-pays are tracked by your managed care plan, and can be viewed in your MI Health account. The MI Health account averages and projects the amount you will owe at 3 month intervals. There are two tiers of co-pays, one for people who are below 100% of the Federal Poverty Level (FPL) and one for people above 100% FPL. (This is the FPL chart the WHP uses. What is the Maximum I Can Make For...? .) 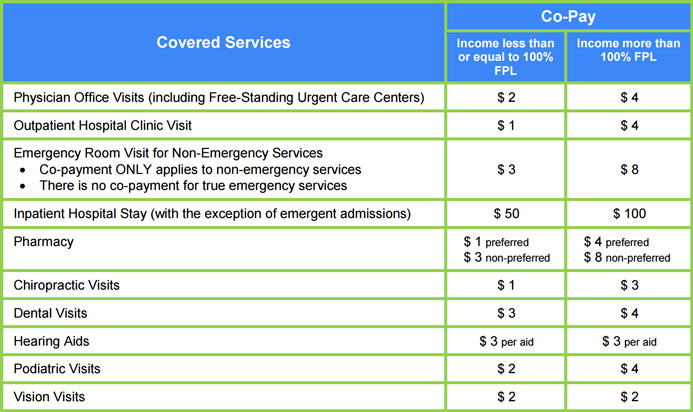 The chart below shows the average amounts for common services. There are no co-pays for preventive services like annual physicals, immunizations, and routine care. Some people are not required to pay co-pays: people under 21, people in hospice or nursing homes, Native Americans and people enrolled in Children's Special Health Care. For some chronic conditions, there are no co-pays. These conditions include asthma, cancer, depression, diabetes, viral hepatitis, glaucoma, hemophilia and more. This document includes the diagnosis codes of all chronic conditions that do not have co-pays. Medicaid Healthy Michigan Plan members who are over 100% of the Federal Poverty Level (FPL) are expected to contribute to their health care coverage. The payment is similar to a health insurance premium for those with slightly higher incomes. This is also a two-tier system, one tier pays and the other tier does not. Again, if your income is above 100% of the FPL, you will pay a monthly contribution to your health care. If your income is below 100% of the FPL, you pay nothing. One person will never pay more than $26.00 per month. For larger households, click here. Watch a video from DHHS about MI Health accounts. If you get a MI Health Account letter and statement, you are responsible to pay your contributions and co-pays. The letter will explain how your total was calculated and what you owe. Your MI Health Account includes both co-pays and contributions. Your first statement will come after you've been a Healthy Michigan Plan (HMP) member for 6 months, and new statements will come every 3 months after that. The amount owed will be recalculated based on the services you use. The member below would owe $6 total for the next 3 months (or $2 each month) and they would receive a new statement for the next period. Here is an example of what the health plan paid and what the member owes. This sample does not include a contribution, only co-pays. MI Health Account Sample Letter. Can I reduce the amount I pay? YES!!! You can cut your contributions in half by completing a Health Risk Assessment with your doctor, and agreeing to work on or keep up with healthy behaviors. You could earn a healthy behavior award that may reduce what you owe. Make an appointment with your primary care physician (PCP) and commit to quitting smoking, losing weight or exercising. Call your health plan to find out how. Report income changes to DHHS! If you are working and your income is above 100%, you will probably pay a contribution. So, if your hours are reduced, your job changes and you are making less money, report it to DHHS. When your caseworker updates your income, you may no longer owe a contribution. I HAVE THE MEDICAID HEALTHY MICHIGAN PLAN BUT I HAVEN'T RECEIVED A STATEMENT. As of April 2017, almost everyone is required to pay co-pays. If you have not received a statement after being enrolled for six months, you may not be required to pay. If you are under income, under 21, in hospice or a nursing home, a Native American or enrolled in Children's Special Health Care, you do not have to pay. If you did not receive any services that have co-pays or are not required to pay a contribution, you will not receive a statement. Your doctor cannot refuse to see you because of an overdue amount. If you don't make your payments, you may have a penalty. For example, if you have a healthy behavior reward, you could lose it. Your information may also be sent to the Michigan Department of Treasury. The overdue amount can be deducted from your tax refund or future lottery winnings. How do I know what is happening with my MI Health Account? As always, call us if you have questions 734-544-3030. 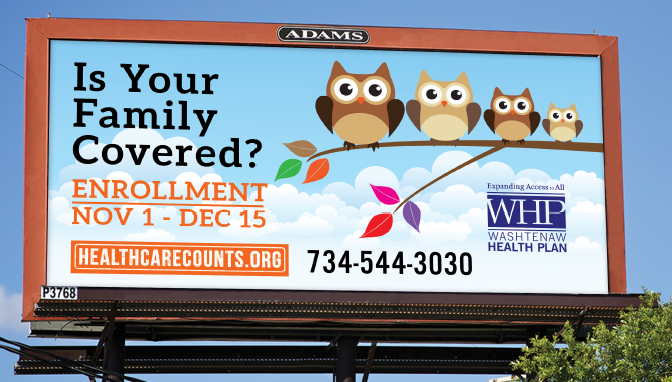 The Washtenaw Health Plan is open Monday - Friday from 9am - 4pm. Walk-ins are welcome. Leave us a question in the comment section and we will do our best to answer it.